At Lakes Landscape Services, we offer everything you need to make sure that your lawn is healthy and thriving all year long. Whether your property is residential or commercial, we look forward to getting to know your yard and learning how we can best serve you. Here are a few professional lawn care services that we offer. Our professional mowing services are available for both residential and commercial properties. These services include mowing all turf areas, trimming, and clearing any necessary debris. We also make sure that sidewalks and drives are blown clean. Click here to learn more. Many people often forget that with a healthy yard comes an effective fertilizing and weed control program. Lakes Landscape Services offers a year-round service to control weeds as well as a customized fertilizer program specific to your lawn. Learn more here. One of the best ways to take care of your yard is to make sure that it’s been adequately prepared for the changing seasons. 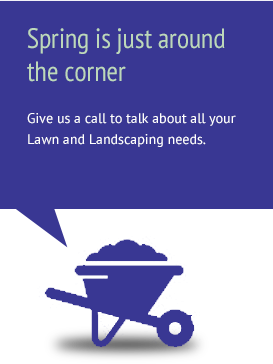 Learn more about how Lakes Landscape Services can keep your lawn healthy year-round here. Core aeration involves removing small “cores” (the cores are 3/4″ to 2″ in depth and about 6″ apart) or plugs from your lawn in order to remove thatch, loosen up the soil and allow nutrients and water to get deeper into the soil. It also allows more air to get into the turf as well. All of these things allow roots to develop longer, stronger systems. The end result is a thicker, stronger, healthier outdoor space. At Lakes Landscape Services, we aerate during the spring or fall so that your lawn can maximize the benefits of the cooler temperatures and become stronger. To learn more or to schedule core aeration for your yard, contact us today! Thatch is the decaying layer of dead roots, stems, and organic material which lies between the grass and root system – and if it doesn’t decay fast enough, it can become a real problem. Excessive thatch buildup makes your roots vulnerable to drought. On the other hand, overwatering thatch creates dangerous fungi which will eventually kill your weakened lawn. Lakes Landscape Services offers rehabilitative dethatching on a case-by-case basis in early spring. Dethatching will remove the buildup of thatch and allow nutrients to once again reach the root system. It also prevents the buildup of dangerous fungi and allow diseases to spread. If you are concerned about thatch build-up in your yard, contact us today to talk to one of our landscape experts. Increase your curb appeal by letting Lakes Landscape Services give any part of your lawn that joins with a sidewalk, patio, or driveway a nice clean edge. Click here to request a free estimate! Lakes Landscape Services can help maintain the size, shape, appeal, and health of your bushes and shrubs by removing dead wood, broken branches, and sucker branches allowing for healthier growth for years to come. Click here to request a free estimate!